The children at the WELS preschool in Raleigh, North Carolina, would never guess that Mrs. Kiecker, the teacher they love so much, never planned on teaching preschool. But early childhood education (ECE)—and becoming a leader in ECE—is now her passion. Choose MLC’s master’s program for early childhood directors. 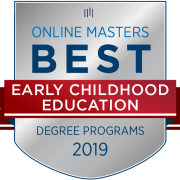 Ranked by OnlineMasters.com as one of the “Best Online Master’s in Early Childhood Education” in the country! The early childhood director track prepares candidates to meet the WELS early childhood director standards. Many required school leadership skills are shared by both principals and early childhood directors, but some are unique. Some courses will therefore be shared with principals and enable early childhood directors to apply content to their context. Other courses are unique in content to early childhood directors. Common courses involve servant leadership, vision, planning, communication, relationships, management, budgeting, school safety, and outreach. Unique courses address issues of child development, early childhood curriculum, and specific legal requirements involving young children. Practical Application is embedded throughout the entire program, but is especially integrated into the research, field project, or internship components.